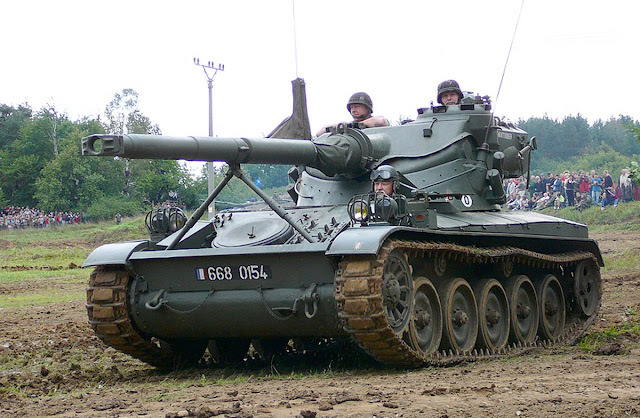 Things get underway with the running gear, and you get an instant reminder that the AMX is only a light tank, as the suspension arms are tiny. Hard to believe they can support 14 tons on the real tank. Takom have engineered these very neatly, with the arms connecting to the hull via square, keyed lugs, meaning it's simple to get them all lined up straight. With the suspension on, it's a quick job to make up the rest of the running gear. There are no poly-caps for the wheels (they're really too small to hold any), but they push-fit tightly on to the axles, and can still be removed later for painting. There's some lovely detailing on the wheels, including the bolt heads on the inner face of the drive sprockets, and the fully open spokes. I sanded the sprocket's teeth to thin them down, making it easier for the tracks to drop over them. The lower hull moulding is quite thin, and on my example the sides were warped inwards. To ensure this didn't affect the fit of the upper hull, I cut a length of square styrene tube and glued it between the side walls, holding them straight. I was a little concerned that the inside of the hull might be visible through the P.E. mesh screen covering the engine vent so, before attaching the upper hull plate, I sprayed the inside of the lower hull black. This subsequently turned out to be unnecessary as the fine mesh prevented any see-through effect. I'd originally thought it was a little lax of Takom to not include any representation of the fan blades below the mesh, but in reality they wouldn't have been visible either. Before going any further, I wanted to tackle the track links. This is the part of an AFV build that I least look forward to, so I wanted to get it out of the way. These aren't clickable links, and will need to be glued together, then wrapped around the wheels. That's not too bad a job with large tracks like those fitted to Takom's Chieftain, or upcoming T-55, but with the tiny links fitted to the AMX, it becomes a lot more fiddly. To make life easier, I built the runs up as two sections, starting with the front half. I found it was going to be easier in the long run to glue the drive sprocket to the track run, since it would then be fixed in the correct position. The downside being that it will all have to be sprayed as one, which will involve a bit more masking. Once the front track section was set, I built up the rear section and glued the two together. The join on the upper run is a little wonky but I can live with that. The instructions recommend 86 links per run, but this left too much sag for my liking, so I removed two links before the glue set. This looked better, but a few days later, the track run had shrunk slightly as the glue fully dried, meaning the run was now too tight. In the end I had to break the run apart and insert an extra link. The right hand track run went on a little easier, as I used a slower setting glue. I still built them in two sections, but this time joined the sections together straight away before either had dried. I also used 85 links for this side, and the sag looked a lot better. I really think that small tracks like these would benefit from being produced in a link and length form. There would be no real compromise in detail, and construction would be so much simpler and quicker. After the hassle of the tracks, I decided to put the hull aside for a while and start work on the turret. Before anything can be assembled, there are a few holes that need to be drilled on the top and sides. The position of the holes are marked with small raised circles, and the ones that need drilling differ depending on which version of the AMX you're building, so check carefully in the instructions which ones need opening up. The unused ones will then need the raised circles sanding off. With the holes drilled, I assembled the main turret parts. The rear panel left a rather big gap which needed filling. This was partly down to the upper turret moulding being warped. There were actually quite a few areas on the kit that required filling due to poor fit, which is unusual for a Takom kit. Before any of the detail parts were attached to the turret, I added some texturing to the cast areas with Mr Surfacer. This was thinned with cellulose thinner and stippled on to the plastic with an old brush (don't use a good brush for this, as it'll get wrecked). When the Surfacer had dried, I lightly sanded it to remove any high spots, and even out the texture. After getting the basic turret together, I switched back to the hull. Most of the detailing is very well reproduced, but there's always a few areas you can improve. 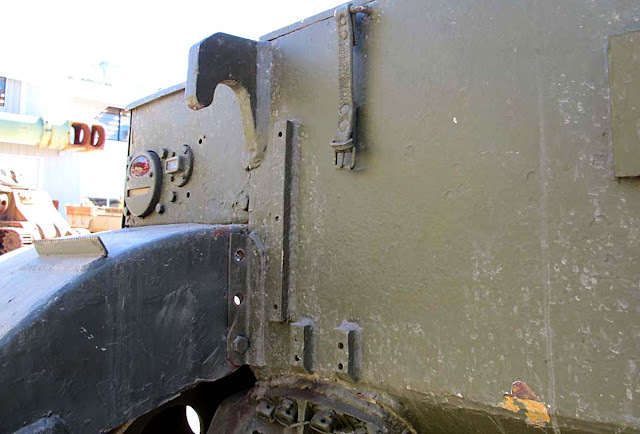 The rear of the hull has rows of tie-downs, and these are moulded solid on the kit part. To add a little more detail, I sliced these off, drilled two small holes for each tie-down, and added small lengths of fuse wire. It adds a nice touch of refinement, and also means you can add straps directly to them. A lot of the parts in this kit feature rather awkwardly placed sprue gates that extend on to the face of the part, and require careful removal and cleanup to avoid damaging the part. In some cases I suppose this is unavoidable due to the shape of the part, but it would be nice to see sprue gates positioned in a way that makes removal of the part less risky. This is the fender mounted stowage box after clean up, and there's still some scarring where the gate was positioned, which is very hard to remove without damaging the remaining details. This part (and the corresponding box on the other fender) also requires a thin sliver of P.E. to be attached to the front face. The whole thing looks OK once in place, but I think it would be better if the front face was supplied as a plastic part, rather than the piece of photo-etch, which was hard to clean up due to its thinness. I appreciate the level of detail that Takom have incorporated into the kit, but it does result in some very fiddly assemblies. Before attaching the exhaust and cover panel, they were given a coat of dark rusty brown. Most of this won't be seen, but it ensures there won't be any areas of unpainted plastic showing at the end. The exhaust also had a coat of rust coloured pigment, held in place with pigment fixer, to give it some texture. There was a noticeable gap were the fender met the rear of the hull which needed sorting. In reality there should be a bolted reinforcing plate over the corner. This was a simple issue to fix. A length of styrene strip was glued over the gap, and three bolt heads added. Most of this area is hidden by the rear mounted stowage basket, so it's not an essential fix. There was also a gap where the front of the fender joined to the glacis plate, although a smear of filler dealt with this. With the larger details added to the hull, I turned my attention back to the turret. At this point in the build you'll need to decide whether you're going to fit the canvas (vinyl) dust collar or not. If you do fit it, you won't be able to elevate the turret. Without it, the turret will elevate as it would on the real tank. The following photos show how it will look with and without the collar, and the degree of elevation you'll get if you don't fit it. I added the collar to my build, as I like the look of it, and I wasn't that bothered about having the gun poseable. With that done, I got on with adding the rest of the turret details. There are two large antenna mounts that attach to either side of the lower turret ring. These feature two short stalks that I had assumed were simply stubby aerials. In fact, they're just the lower sleeve for the main whip aerial, so you'll need to add those from stretched sprue or wire. Since the aerial stalks had a lot of flash, and were also quite delicate, I replaced them with 0.4mm brass tube, which will also give me something to insert the main aerial into. With the aerial mounts attached, I added a weld bead around them with stretched sprue. This was first glued in place, then liquid cement was brushed over the sprue to soften the plastic, after which the tip of a knife blade was used to add the weld texture. The smoke canisters were added next, and a length of twisted fuse wire was used to represent the retaining chains on the end caps. Some fine photo-etch chains would have looked better here, but I didn't have any to hand, so these may get swapped in the future. There are a lot of detail parts that need attaching to the turret, and it's worth leaving some of the smaller, more delicate ones till last, or you'll end up scrabbling about on the floor looking for parts that have been knocked off. Some of the grab rails are very thin, and it's best to remove these with a fine razor saw to avoid the possibility of then snapping. 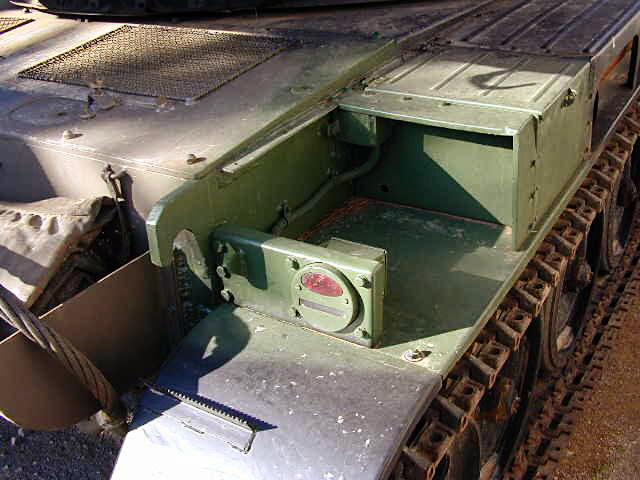 The turret features a large spotlight that can either be mounted on a platform on the rear of the turret, or in its stowed position on the side. If you're going to have it fitted on top, you'll need to add a bulb as the kit doesn't supply any internal detail for the light, and that's very obvious through the crystal clear lens. I mounted the spotlight on top but got around the lack of internal detail by adding a circle of lead foil, wrapped round the edged of the lens, which I'll paint to look like a canvas cover. Up till now, I'd left some of the more delicate P.E. parts off the hull, but these now needed adding. The engine grills went on without any problem, although they were slightly too large for the recess they're meant to drop in to, meaning they overhang slightly along one edge. This isn't really that noticeable in person, so not a major issue. As the mesh is so fine, there's no problem with see-through, but you'll need to be careful when painting to avoid clogging the holes. Some of the other P.E. details are very refined, including these tread plates with a very fine, serrated edge. In the photo you can also see the two reflectors mounted on the rear of the fender stowage box. Takom would appear to have moulded these upside-down. The oval section should be at the top. The last, and most delicate, parts to assemble are the intricate headlight guards. Each one is made up of two plastic and three P.E. parts, and you'll need a pair of tweezers and a steady hand. The etched slats on the guard need to be twisted through 90 degrees, but this is actually quite simple, and the finished guard looks fantastic. With those last details added, the build was complete, or at least as complete as it will be before painting, as I'll be leaving some smaller parts off to paint separately. I've been slightly torn during this build. Some aspects have been a lot of fun. Some, mainly the tracks, have been a little frustrating. There are a few unnecessary mistakes here and there, and the fit of some parts wasn't perfect. If you're prepared to put in a little effort though, the end result will be a very detailed model of this little French beauty. In part III we'll see how she looks in full colour (well green anyway). Stay tuned.